Medifast is clinically proven. Developed by a physician, it's the brand recommended by more than 20,000 doctors since 1980. Medifast customers lose weight while learning how to eat healthier. 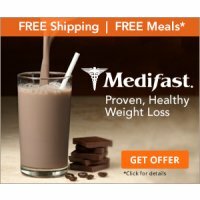 Medifast Meals are formulated with protein and fiber, and fortified with vitamins and nutrients, so you lose pounds and inches without losing out on essential nutrition. Never miss a meal. Never worry about meal planning. Order Medifast GO & Get 28 Free Shakes on Your 1st Order with renewal.